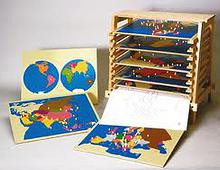 Montessori education is an approach developed by Italian physician and educator Maria Montessori. Dr. Montessori, born in 1870, believed that given the proper environment, children had the innate ability to discover, learn and attain a high level of independence. Based on her observations, Montessori also believed that children at liberty to choose and act freely within an environment prepared according to her model, would act spontaneously to further their own development. Thus, the aim of the Montessori program is to encourage and nurture that growth – essentially to "help children help themselves". Montessori education is characterized by an emphasis on independence, freedom within limits, and respect for a child’s natural development and curiosity. It is a multi-sensory approach where students learn from working with and touching materials rather than solely by verbal instruction. The main focus of the philosophy is the education of the child’s "whole personality". Through his or her involvement in real life activities, the child has the opportunity to develop emotionally, physically, socially, intellectually, and culturally. 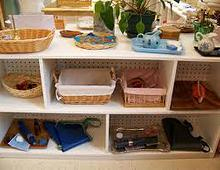 Children typically enter a Montessori classroom class room between the ages of two-and-half and three years of age. Young children begin with the simplest exercises based on activities young children enjoy. The exercises a child uses at three years of age will help develop the concentration and coordination necessary for more advanced exercises the child will experience at the age of five or six. The entire program is purposefully structured to an individual child’s developmental needs. Dr. Montessori referred to the classroom as the prepared environment – as a place carefully established by the teachers to offer beauty, order, and reality to children. It is our mission at Beaverbrook Montessori to provide best possible environment for our students’ lifelong learning and growth.